Bombay has a vibrant theater scene with plays in many languages, in South Bombay most performances take place at the NCPA (National Center for Performing Arts) and in the western suburbs at Prithvi an intimate space owned by the legendary Kapoor family and named after Prithviraj Kapoor. My friends and I arrived just in time to be able to survey the Prithvi Café and catch a platform performance. The platform performance was scripted and performed by a young actor and playwright. It was funny and was based on the notion of Sita writing four letters to her mother describing her life after marriage with Lord Rama. The play begins with the audience getting a glimpse of the lives of the Parekh’s and their future son-in-law. Their quirky talks, misunderstandings and scheming behaviours makes them seem dysfunctional but most families will relate to their clandestine ways, characters of which are timeless and make the story universal. In “Dance Like a Man” Jairaj and Ratna, a couple who have been Bharatnatyam dancers help their daughter Lata establish herself as a brilliant dancer. After her debut performance Lata receives rave reviews and is touted to be an outstanding dancer of her generation unlike her parents. Her success creates tensions and Rantna reveals that she is jealous of her daughter and demands credit for her success. She disrespects her husband and at some point refers to him as “a spineless man” for destroying his own life by rebelling against his father who was deeply opposed to the idea of his son being a dancer. Engaging and dramatic, the play is layered and it is through a series of flashbacks that the story is revealed. All the actors are skilled and play dual roles except for Lilette Dubey. Dubey plays older Ratna, Suchitra Pillai plays younger Ratna and her daughter Lata, Vijay Crishna plays older Jairaj and his father Amritlal Parekh and Joy Sengupta plays younger Jairaj and his son-in-law Viswas. The performances are natural and characters slip in and out of their dual roles effortlessly. Personally I am a big fan of Lilette Dubey and the very reason I went to watch this play in the first place. Her acts are always infectious and enchanting and being seated in the second row was celestial. Having said that my friends and I were surprised by the performances of the rest of the cast and especially Vijay Crishna, who seemed natural and whose pain was contagious. At times it was unbelievable and uncanny how the life of Jairaj(played by Vijay Crishna) seemed to resemble my own and many of my friends. In this case a dancer is struggling to fight all odds for his love and passion for dance and make it on his own and how many of us are in the same boat. This play captures the lives and values that transcends through three generations of a family and the conflicts between generations. No matter how disturbing the play becomes at times, the audience experiences transformation as we laugh and cry with the characters. Written by Mahesh Dattani and directed by Lilette Dubey. 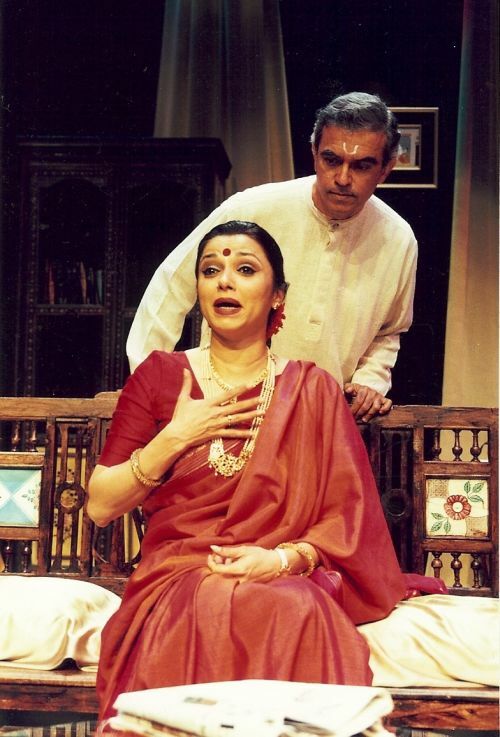 This entry was posted in Art, Culture and tagged Bombay, Dance Like a Man, Joy Sengupta, Lilette Dubey, Mumbai, NCPA, Play, Prithvi, Suchitra Pillai, Theatre, Vijay Crishna. Bookmark the permalink.